(1) The Siren 2000 M10 electronic siren serves to alert the fire and rescue services and to warn the public in the event of an emergency. (2) The system consists of an electronic control unit and two acoustic radiators. The current required for operation is taken from two absolutely maintenance-free lead batteries. Prolonged operation is guaranteed even in the event of a power failure. Mains-independent operation on a solar power supply is also possible as an option. (3) The control unit contains 8 short-circuit-proof, overtemperature-protected low frequency amplifiers with two 125W output power each. (4) The processor module UP98 takes over optional controls. This also accommodates the radio interface and the digital voice memory module providing these options have been ordered. (5) The SLG98 power supply unit provides a temperature-compensated and conserving charging of the batteries. It also supplies the voltages required for the system. For feeding of a two way-radio a 12 volts / 0.4 A power supply is already built in. If necessary, a converter module at 50W can be optionally adapted for feeding a radio system. This reduces the 24 V battery voltage to the 12 V supply voltage without losses. This unit also contains the charge controller for alternative solar energy supply. (7) A notebook or a service device can be connected via a programming adapter to a 37-pin SUB-D socket. This can be used to check the operating states of the system and load new program routines. (8) The various terminals, fuse holders and an overvoltage protection element for the 230 V mains supply voltage are located on the mounting rail. An optional overvoltage protection can be installed in the antenna cable. (9) The complete electronics, including the batteries are installed in a steel cabinet with the dimensions 600x1000x350mm. The cabinet is electrophoretically dipped and powder coated with RAL 7032. (10) The cable inlets for mains and external alarm generators and the acoustic radiators are on the bottom of the machine. (11) The basic equipment includes a connection possibility for an external radio control as well as a fire and fire drill alarm. (12) A radio control, an operating and display panel, a handheld microphone with preamplifier and a digital voice memory with 180 s recording time can be integrated as options in the cabinet. The operating and display panel can also be fitted with a goose-neck microphone and is available in remote form as a desktop or wall-mounted model. (13) The outdoor unit consists of sixteen acoustic radiators with the appropriate flanges and covers. They are made of corrosion-resistant diecast aluminum. All screws and fastenings are made of stainless steel. 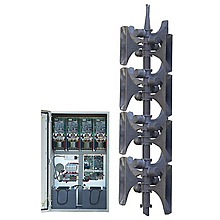 An antenna carrier can be mounted optionally. (14) The use of high-quality, reliable components mean that no maintenance work is necessary in the whole system. The required technical data are fully complied with in a temperature range from -40° to +70° Celsius. However, the use of lead batteries restricts the application to-25° Celsius. In this range the capacity may drop dependent to the load. Common trouble indentification via potentialfree relay-contact as an option.